There have been a number of interesting pieces presenting the story behind the march, behind the people who organized it, and the people who participated. You can find some of those pieces here, here, here, here, and here (linking to writer and broadcaster Jean Shepherd’s incredibly interesting radio broadcasts about his participation in the march; the popular movie “A Christmas Story” is based on Shepherd’s autobiographical stories). Or just click on today’s Google doodle to find a host of links. While reading a good number of pieces on the march, I realized that I cannot recall once in my entire 19 years of public schooling (elementary and secondary schools, plus public college and law school) that I ever read or heard about that event and never, not once, did I ever read or hear King’s speech. Not in a social studies or history class and not in an English or speech class (as an example of power, persuasive text and presentation). Not once. I had heard of it, of course, and probably could even quote snippets. But I don’t recall personally reading or listening to it. I was probably 31 years old when I first heard the full speech, and only then it was through my preschool-aged son’s friend’s family. My son’s friend was an African-American boy and his family invited my son and me to their church for a Martin Luther King, Jr. day celebration. As part of the celebration, a recording of the speech was played. Here it was, mid-January, and I had goosebumps. The beauty of the writing, the power of King’s presentation, and the importance of his message brought me to tears. Fortunately today, most people today have been exposed to either the text or the video of the speech. (And, of course, with the internet, it’s not hard to instantly find both. You can find the text here and the video here.) This may be due, in large part, to the establishing of the federal holiday to honor King. President Reagan signed the bill establishing the holiday in November 1983, but it was first celebrated on January 20, 1986. King gave his speech in, as he noted, the “symbolic shadow” of President Abraham Lincoln, at the top of the steps of the Lincoln Memorial. Lincoln, of course, signed the Emancipation Proclamation 100 years before, in 1863. Yet, despite that proclamation and the passage of the 13th, 14th, and 15th Amendments immediately following the Civil War, African Americans were still denied, in reality, full civil equality. King’s speech set forth a vision of an egalitarian America, in word as well as in fact—one where, as he states, “this nation will rise up [and] live out the true meaning of its creed: ‘We hold these truths to be self-evident, that all men are created equal.’” It was a lofty vision 50 years ago, when Jim Crow segregation prevailed and where discrimination by race was unabashedly open. 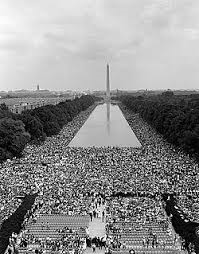 But that vision, delivered on that day, captivated the nation, for King’s dream of a better and more equal and just America represented our best visions of ourselves as a nation. 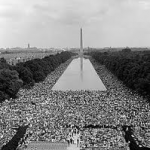 Still, it took a couple more years (and President John F. Kennedy’s assassination) before the triumphs of the Civil Rights Act of 1964 and the Voting Rights Act of 1965 brought the nation several steps closer to realizing King’s vision. When King was gunned down in Memphis in 1968, his dream did not die with him. It lives on, in the memories of the people who heard it originally and in the hearts and minds of people who have heard it since. But it’s a dream still not fully realized. While segregation and discrimination have been formally eliminated (and considered illegal if not immoral), their formal elimination has not translated directly into full equality. Both still exist in subtler forms. We still have segregated schools due to segregated residential patterns. We still have a wage gap and a mobility gap. Black men are incarcerated at higher rates than white men. A great post on a great day. Thank you!